In a new article from the patient advocacy and research nonprofit Jordan’s Guardian Angels, NYSCF speaks about its work creating induced pluripotent stem cells from patients with Jordan’s Syndrome—a rare disease resulting from a mutation in a gene with links to autism, Alzheimer’s, intellectual disability, and cancer. The disease was named after patient Jordan Lang, who showed difficulty feeding and breathing after birth and experienced developmental delays throughout her childhood. The team created stem cell lines from five patients with Jordan’s Syndrome and has now shared the lines with scientists at Rutgers University for duplication and distribution. “Because Jordan’s Syndrome is a rare disease with only a few dozen known patients worldwide, the stem cell lines we are making will provide a foundational resource for researchers who may not have easy access to patients,” the team explains. 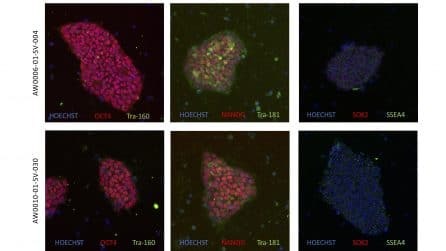 Generating stem cell lines from these patients will allow scientists to generate patient-specific brain cells, study the cellular basis and genetics of the disorder, test drugs, and examine how molecular processes in the cells may lead to other diseases. Rare diseases often hold the key to fundamental biological processes that go wrong in other disorders, giving researchers valuable insight into the basis of many conditions. Read the full story here, and learn more about Jordan’s Syndrome and Jordan’s Guardian Angels here.